In the photo above we can see how the old State Route 50 Bridge over Weber Creek is dwarfed by the newer highway bridges. It looks like the newer bridges are on taller embankments, perhaps because they are raised above the 100 year flood (or maybe they are just longer and going over a deep valley). 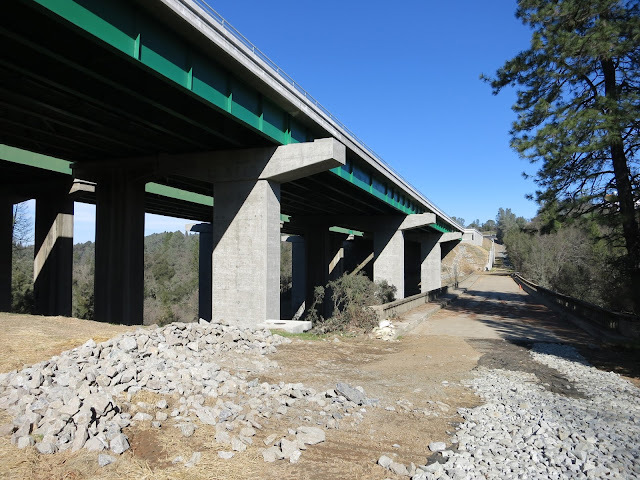 The old State Route 50 Bridge is a five span haunched girder bridge with in-span hinges at the first and fifth spans. I think the bridge might have been rehabilitated at some point. Note the interesting roller bearings in the photo below. Those don't look like they were built in 1938. The bridge is now 75 years old, which makes it eligible for designation as an historic place. However, I couldn't find any reference to this bridge. It looks like a new end diaphragm and new wingwall (and perhaps a new abutment) were cast recently, perhaps because of the widening of the newer bridges? 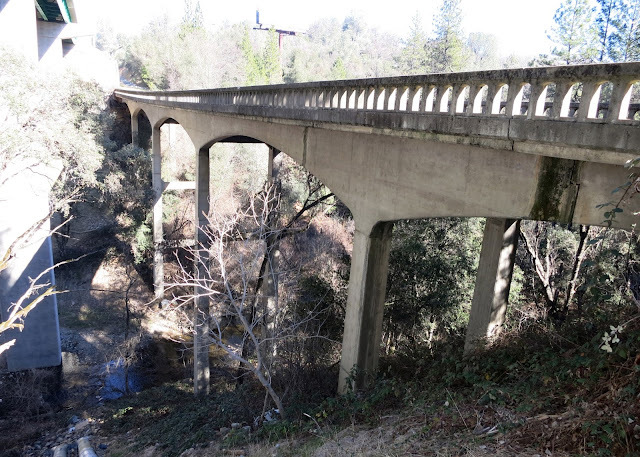 El Dorado County, California's Bridges: State Route 50 across Weber Creek (2) by Mark Yashinsky is licensed under a Creative Commons Attribution-NonCommercial-ShareAlike 3.0 United States License.